Eat, Fast, Slim explains how you can use fasting as a healthy approach to weight loss. It offers an alternative to traditional diets that is simple, easy-to-follow and a low-cost option for today’s obesity problem. 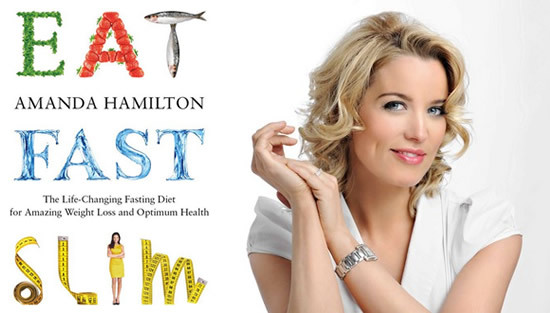 Author, Amanda Hamilton is Britain’s best-known celebrity nutritionist. She was first introduced to the benefits of fasting while living in an Ashram in the Himalayas. More recently juice fasts have gained popularity as people are discovering the value of cleansing and detox diets. Intermittent fasting has also been employed by bodybuilders to fine-tune their physique. Amanda Hamilton begins by explaining the benefits of fasting versus other weight loss methods. Traditional diets that consistently restricting calories can actually make it easier for you to gain weight over the long term. Conversely fasting may provide a range of health benefits in addition to promoting fat loss. Intermittent Fasting: Alternating periods of fasting with periods of normal eating. Juice Fasting: Involves consuming only fresh juices for 1-5 days. Both methods complement each other and can be used as a combined approach for achieving your ideal weight and optimal health. Intermittent fasting helps keep hunger under control. This is partly because of how it affects hunger hormones but also because it helps you distinguish the difference between physical and emotional hunger. Fasting is less likely to slow your metabolism than conventional diets. Regular juice fasts can provide a powerful anti-aging effect. Fasting may improve concentration and could even help to build new brain cells. There are four different fasting plans offered in Eat, Fast, Slim. A questionnaire is included to help you choose the one that will work best for you. Before you start your chosen fast you should spend at least one week to clean up your diet. If you jump right in and drastically change your eating habits you could experience some uncomfortable side effects. This plan is designed to ease your body into fasting gradually. It is based on wholesome, unprocessed foods including fruit, vegetables, whole grains, nuts and lean protein. On this plan you will skip breakfast and break your overnight fast around noon. All of your food should be consumed between 12pm and 8pm. Alternatively you can skip dinner and have a more substantial breakfast and morning snack. With this fasting method you eat normally for five days a week and limit your calories to 500 for two days. This plan can be followed for one to five days and is best undertaken when you have the opportunity to rest and relax. It involves five juices and a broth spread evenly throughout each day. The morning juices are a little sweeter and contain more fruit, while afternoon juices are more savory and vegetable based. At the end of the day you consume a liquid broth or miso soup. Salmon, tuna, chicken, turkey, beef, lamb, shrimp, goat cheese, eggs, lentils, hummus, oatmeal, granola, rye bread, rice, walnuts, cashews, peanut butter, asparagus, spinach, red pepper, mushrooms, apple, pear, berries, watermelon, pineapple, papaya, miso, vegetable broth, olive oil. Skip breakfast and have your first meal around noon. Contrary to what you might expect, exercise is not contraindicated while fasting in Eat, Fast, Slim. Doing weight training while fasting can actually help your body build more muscle. However, it is recommended to limit high-intensity activities during the first week until you see how your body responds to fasting. Eat, Fast, Slim: The Life-Changing Fasting Diet for Amazing Weight Loss and Optimum Health retails at $14.95. Offers advice on the safest methods of fasting. Provides options to suit different lifestyles and preferences. May be easier to follow than long-term calorie restriction. Includes recipes for juices and main meals. Fasting has been scientifically demonstrated to provide a range of health benefits. Many dieters experience uncomfortable side effects when fasting such as fatigue, dizziness, constipation, nausea and insomnia. May be difficult to fit in with your lifestyle. Not suitable for dieters with a history of eating disorders. Eat, Fast, Slim highlights the benefits of fasting for weight loss and health and offers a few different ways to incorporate fasting into your lifestyle. Intermittent fasting can be an effective weight loss method that may be easier to follow than long-term calorie restriction diets. Hamilton, A. (2013). Eat, Fast, Slim: The Life-Changing Fasting Diet for Amazing Weight Loss and Health. Duncan Baird Publishers.